In fact, St. Moritz’s therapeutic springs first attracted summer spa guests as early as in medieval times. And it became the premier Helvetian settlement to bring the sinister age of darkness to a (de)lightful end in 1879 – by treating its handful of inhabitants to the rare commodity of electric current. Classical winter tourism was soon to set in and in 1928 and 1948, the only Olympic Winter Games ever held on Swiss territory were hosted on these snowy local slopes. Today, the community provides 5,300 beds in around 40 traditional hotels of the four and five-star category plus some 7,500 more in homely holiday apartments. In a prosperous year, over one million overnight stays consumed by approximately 250,000 guests are recorded (30,000 more in summer than in winter). To handle such enormous influx, a seasonal service army about 3,000 strong joins forces with St. Moritz’s 5,400 regular citizens. In order to discourage tampering with its mundane label, „St. Moritz“ became a registered trademark in 1986, which is now protected in some 50 countries. The brand is associated with a picturesque alpine village treasuring its traditions, but also with abundant wherewithal spent by privileged residents and guests alike in their carefree lives of ease. It also implies that health and good looks are self-induced and smoothly achieved and maintained by means of sporty activities. 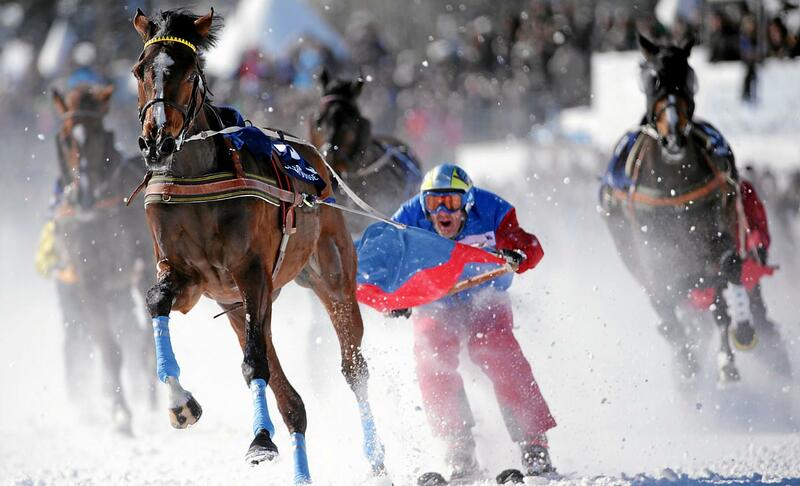 The first „skijöring“ race took place in 1906, from St. Moritz to Champfèr. It started off what was later to become the “White Turf” event. Today, flatracing and trotting competitions form part of the challenge. 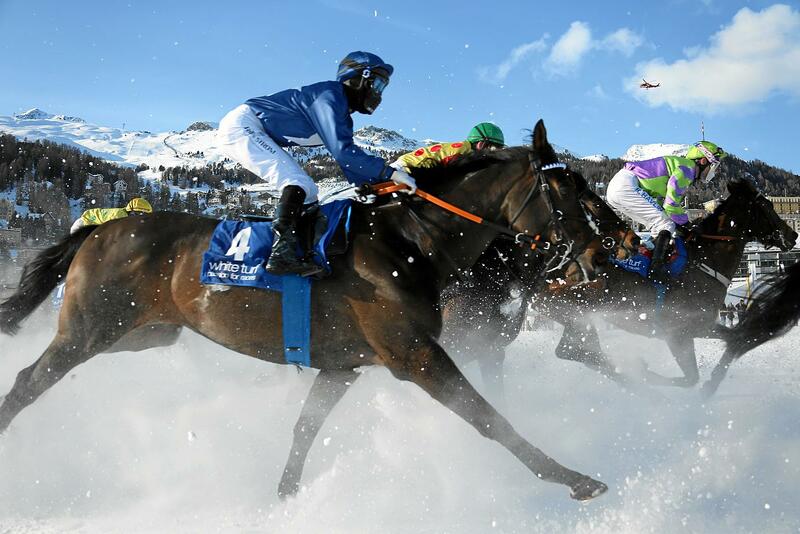 The indispensable prerequisite for this traditional equestrian extravaganza is for St. Moritz lake to freeze over in a solid crust – which it duly seems to do, regardless of the climate worries prevailing elsewhere. Each year, on three consecutive Sundays in February, hooves are flying on ice 60 centimetres thick with spectators pricking their ears to the thunder of horse-shoes pounding into the compacted surface. Amidst a blizzard of crystal flakes or entire chunks of snowy sods, riderless thoroughbreds are dashing along the 2,700 meter long track of „turf“ at a tempo that may well exceed 50 km/h. In their tow are daredevil skiers demonstrating an unusual athletic discipline: „Skijöring“ derives from Norway and means „driving with ropes“. 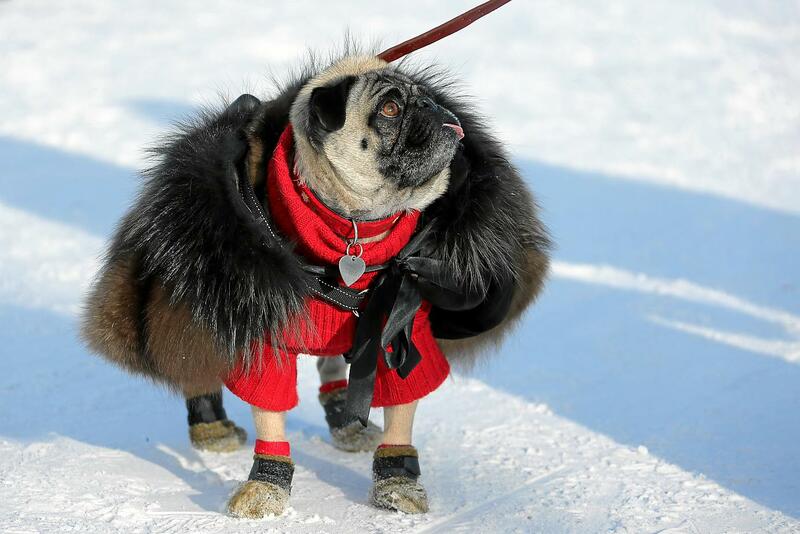 The sporty challenge requires a high degree of physical prowess, skiing skills and the contestants’ durable control of their four-legged counterparts. Stallions trampling across someone’s skies at full speed can cause serious accidents. Thus, skies have been given colourful coatings in order to render them more recognisable to the race-horse’s eye. Thoroughbreds from all over Europe are ridden by internationally renowned jockeys. The start of each race represents one of the most crucial stages: Headstrong stallions may choose to charge off in directions different from the ones intended by the riders. But it is also vital to secure a favorable position ahead of the first bend. 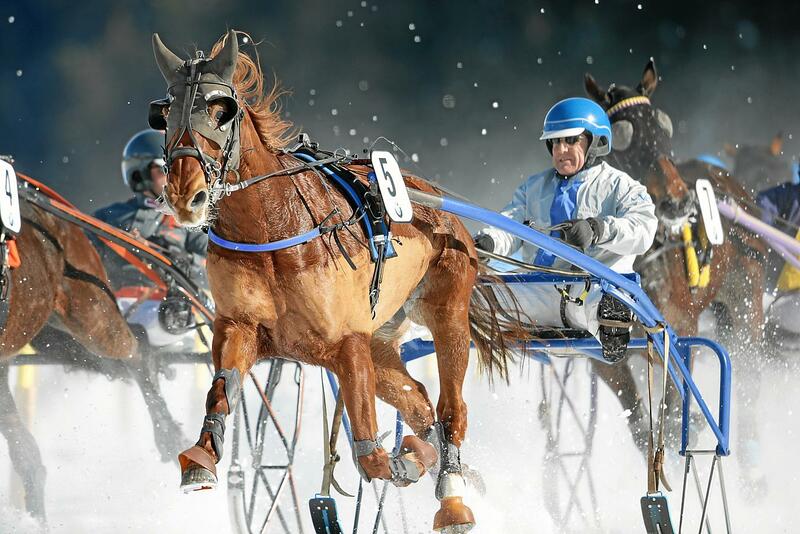 The exciting Trotting Race is a fixed feature during the White Turf competition. All photos, including the header image, are by the courtesy of ©swiss-image.ch/Andy Mettler.